Not all Gingerbread Cookies are editable. We are not talking about poorly cooked cookies, but rather Gingerbread Men and Women decorations, and now… kids toys! We found these fun little toy set (small, so not for kids under 3) of all kinds of Gingerbread Men and Gingerbread Women. “Learning Resources – Smart Snacks Gingerbread Sort & Snap” Each painted up colorfully and unique to each other. 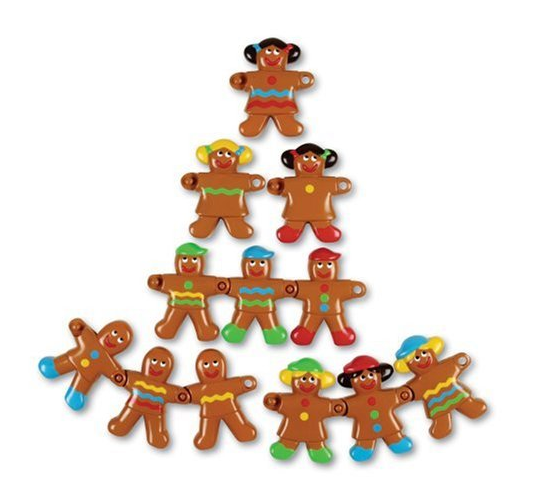 An added bit of fun for kids is that the hands snap together so they can make Gingerbread ‘people’ chains. Since each figurine is different from the next, it could be fun to make a chain of grouping two next to each other with the same color hair then the same color pants, etc… Hmmm… maybe we need to get a set for the adults here to play with.